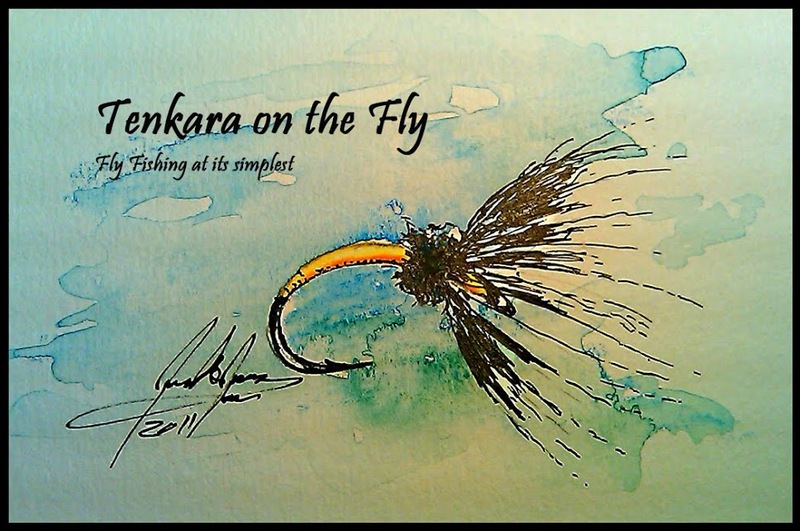 After spending a week in California, I had one day of spare vacation time which I used to head to the South Platte to fish some more with the Tenkara USA ITO in pursuit of bigger fish than I would catch in RMNP or on BC, my other favorite spots to play around. As I might have written earlier, the South Platte is a very different fishery (being a tailwater) than BC or any of the high country creeks. It's a mid-size river with good fishable flows from arond 150cfs to somewhere around 400 cfs. If the flows are higher, I consider heading to a different river or creek. It's also a river that is still recovering from the effects of the Hayman Fire that devasted the area around Cheesman Canyon and Deckers in 2002. The South Platte offers a lot of different water, riffles, pools, pocket water etc. and there is a lot of "decomposed" granite in the river looking like little rough pebbles. Many sections look like there is no cover for fish at all but thankfully there are many more sections that provide enough cover and holding places. Anyway, I fished a section that I haven't fished before (there is a $5 parking fee), playing around and testing the ITO. The day began slow, it was in the 40ies when I got to the river in the morning. I started out with an nymph attractor/dropper rig at first but could only convice very few fish to be interested, most of them hit, of course, the small dropper, my mercury RS2. As it warmed-up, I decided to see if any fish would be looking up; the section I fished was not too deep and at a flow of about 200cfs chances of getting dry fly action were ok (the SP is traditionally NOT a dry fly river). I tied on my trusted CDC & Elk (size 16) with an burnt orange body (October Caddis imitation) and soon I was able to entice a few fish to come up and take my fly. I was happy as a little kid in a candy store (well, I am always happy when I am actually able to get out fishing). The action was not overwhelming, but surprisingly steady. I focused on pocket water, eddies behind rocks and other structure such as trees, undercut banks etc. Basically any water that had structure and was not just decomposed granite. I landed more than a dozen fish, most of them brown trout with the males already showing first signs of spawn colors and kypes. The highlight of the day was when I was fishing back upstream to where my car was parked, hitting pockets in the fast water and getting hits on almost every other cast, which didn't go un-noticed by two kids in their twenties nymphing further downstream. One of them actually came up to ask what I fly I was using and noticed that I had no real. I explained to him that this is Tenkara and he said, "oh, yes, Japanese nymphing!" I just chuckled and replied "yes, Japanese Fly Fishing". He nodded and headed back downstream, not being interested to learn more. It was a good day on the river and my ITO got a nice workout. I didn't catch any monsters, but a few fish in the 12-14" range which the rod handled quite beautifully. I definitively like how the rod casts collapsed at 13', sometimes I extended it to it's full 14'7" to be able to cast to some spots farther away if I couldn't or didn't want to wade closer to. Once a good fish was hooked, I liked to extend the ITO to it's full length and use the added leverage for landing. The rod is soft, but I like it!